Harlequin bugs (Murgantia histrionica) are one of this region’s worst vegetable garden pests, and I thoroughly dislike them, but I do have to admit they’re quite pretty. Their common name comes from the commedia dell’arte character Harlequin, and their Latin name also reflects their show-off nature. These are not bugs that need to hide. They descend on plants in large numbers, mating, laying eggs, and sucking on plant juices, and birds don’t seem to bother them (likely they taste bitter). They’ll feed on many different plants, but commonly they attack brassica family crops such as mustard, kale, broccoli, or radishes. Working together, they can render a plant inedible in days. Please visit our Harlequin Bug page on Grow It Eat It for more information. Here’s what I do (especially in the Derwood demo garden where they are a serious problem) to make these pests less devastating. 1) Plant early. 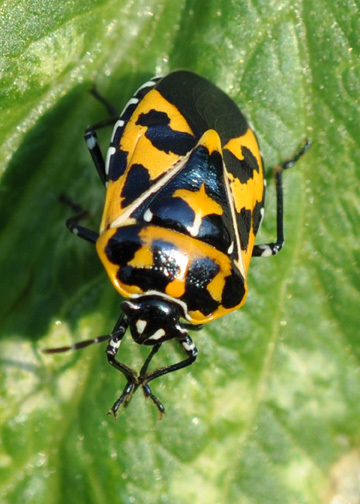 Harlequin bugs don’t usually appear in large numbers until July, so if spring crops go in early the plants are producing well long before the bugs show up. Heat often spoils these plants before July anyway, but we still had productive mustard and kale when the bugs appeared. 2) Use row covers. 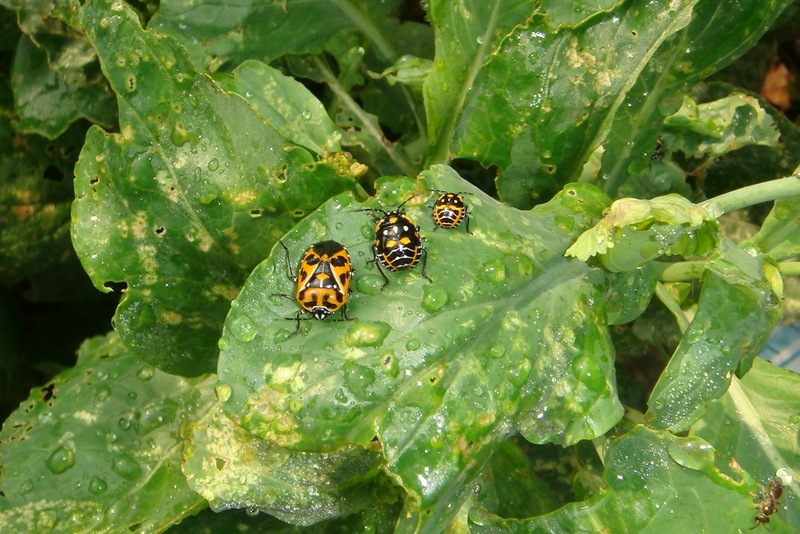 For brassica family plants, this is more necessary in the fall than the spring, since harlequins hang around until the weather gets cold, but I cover the plants in the spring anyway because of other pests (see Tiiu’s post). Caution: if your plants are pressing against the row cover, harlequins will feed right through it. 3) Seek out and destroy eggs (described at above GIEI link) and nymphs (young stages). The earlier you get them, the easier. 4) Kill adult bugs, preferably by drowning in soapy water. They tend to drop when you try to catch them, so put either a hand or the bucket directly underneath. 5) Plant trap crops which are intended to be sacrificed while full of bugs. Cleome is one of the best, since it’s harlequins’ absolute favorite. You may have to be brave and throw out a flowering plant, in that case. What also works is to leave your spring crops in the ground and use those as trap crops. That’s where our mustard went, eventually. The easiest way to dispose of trap crops is to put the whole plant, bugs and all, into a black plastic trash bag, close securely, and then put the bag in the sun for a couple of days, until the bugs are all dead. Then you can compost everything. Do not do what I just did and leave the bags for an entire week in the heat; what’s inside after that is seriously smelly. If you’re putting in brassica plants for fall harvest soon, covering them until the harlequins hibernate is the best bet. Uncover when you no longer see any bugs hanging around. Harlequin bugs hibernate in plant debris and the top layer of soil, so cleaning up the garden in late fall and raking the soil can help prevent emergence next year. We are having a really hard time with harlequin bugs this year. I am thinking of pulling up and disposing of the curly kale that is inundated, but I am worried that they will just move on to other plants? (They are lightly infested on other plants). Advice? Our brusselsprouts are looking very sad too (and they are our favorite). We grow organically, and have never used insecticides, but should we try neem or pyganic sprays? Is anyone else having a tough year with Harlequins? Hello fellow Erica, and sympathies. Yes, the bugs will probably move on to other plants, but I'd still advise pulling up the kale – try getting it and the bugs into black plastic bags and letting them roast in the sun. You can spray – try insecticidal soap first and then the other pesticides if that doesn't work – but you aren't likely to kill adults that way, only the nymphs. Hand-picking and drowning in soapy water still works best, though it's tedious. Good luck!